Hello Sage school garden supporters! We are working on getting supplies donated to complete two large upgrades to our garden and need your help in building a fence around our pumpkin patch in time for the kids to plant pumpkins this year. We will also be building new higher garden beds with new gopher wire. We need to keep all the destructive critters out. We would really appreciate any and all help we can get in building the fence. We will provide a BBQ lunch, fresh air and good company! Please sign up to help! Thank you! 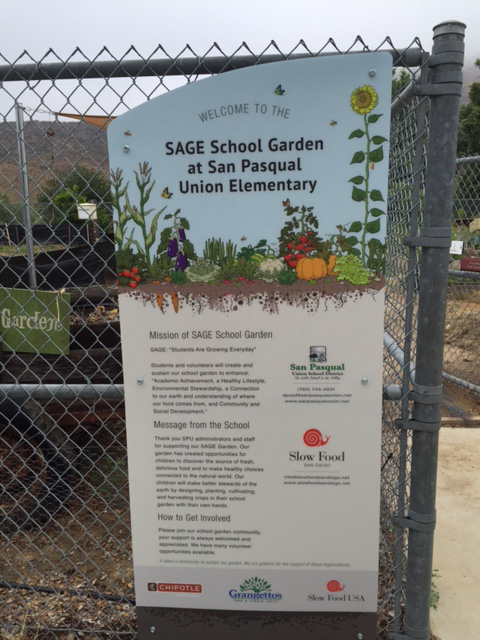 New sign for the Sage School Garden at San Pasqual Union Elementary where our members volunteer. Cooking Classes you can sign up for yourself for a great slow food event. GOOD BYE BOOK CLUBS, hello Cooking Clubs! Join us in our restaurant while we stir up a whole new way to socialize. Watch as our talented Culinary Team prepares your meal in an interactive Learning Environment and gives you tips about how to cook special dishes. 3 hour hands on demonstration includes all food/beverage. Located at the Bernardo Winery. Diane: Thank you for including me in this event. It was a pleasure to meet you and other Slow Food members. Let’s celebrate in the North County!